We were so lucky to be invited to a media preview evening in Old Eldon Square on Friday evening to sample wagamama‘s new spring/summer menu which launches next week! 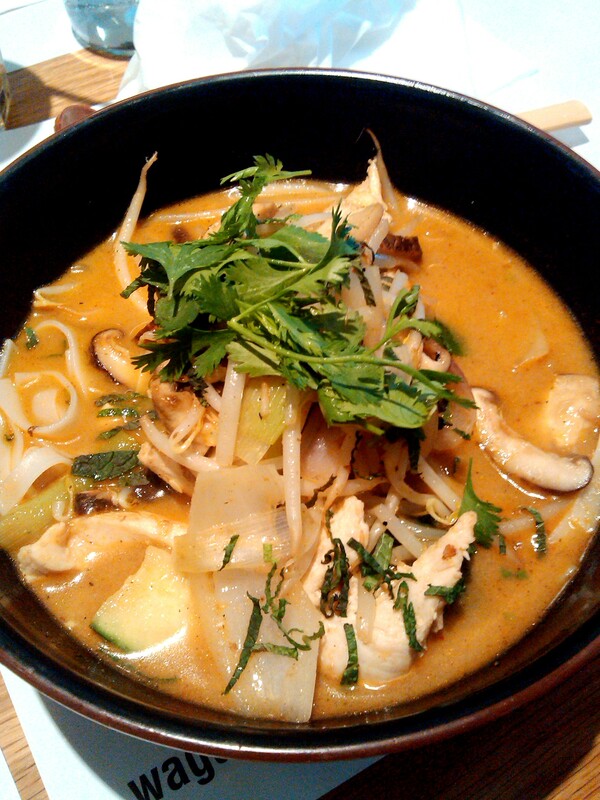 We have always been big fans of wagamama‘s fresh, healthy cooking and knew that we were in for a delicious night. The new additions to the spring/summer menu include two new juices, several sides, salads and main courses. The two new juices went down a treat with me and MrJ. 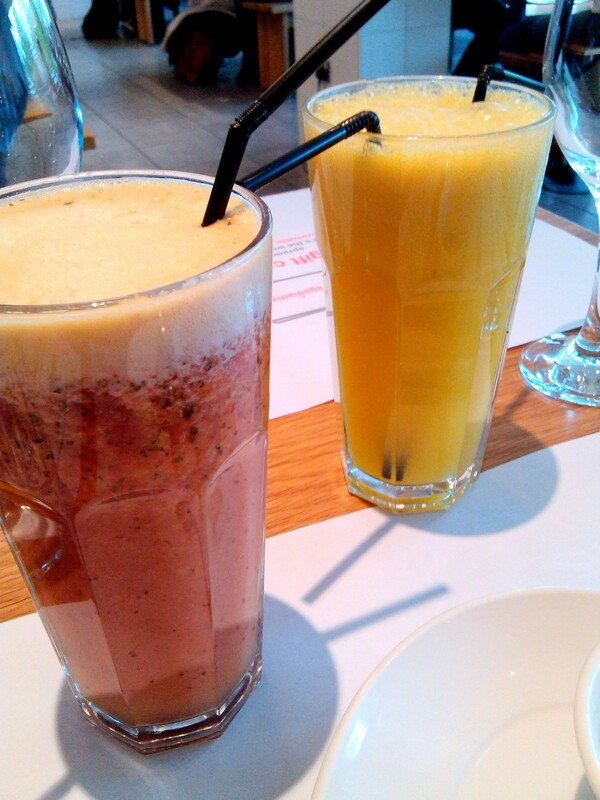 One was mainly strawberry based while the other one was a fresh mango and apple combo. I must say I preferred the strawberry one, especially as it had a hint of mint, which always reminds me of the delicious juices we used to buy when we were holidaying in New York. MrJ preferred the mango and apple juice as it was fresh and sweet. You’ll have to try one, so you can be our tie-breaker! After our delicious juices had arrived, we were treated to an array of side dishes which included rice paper spring rolls and a lettuce wrap. 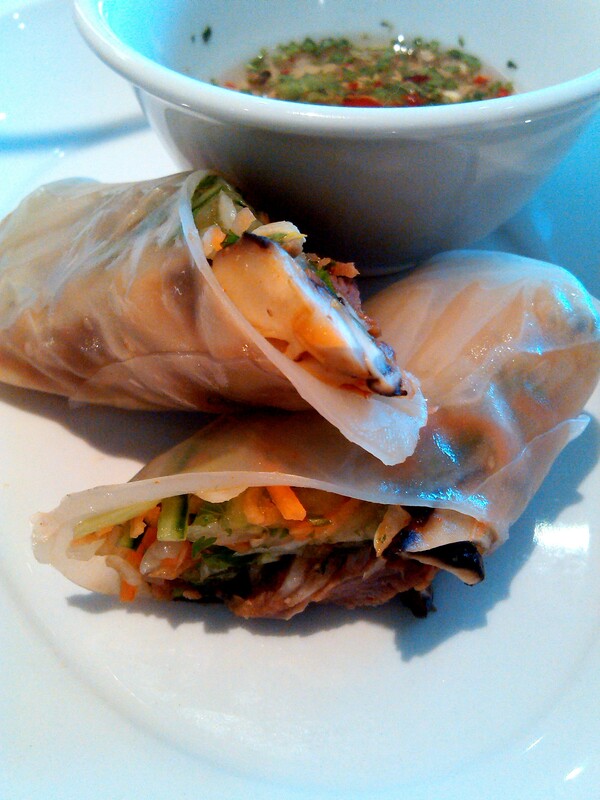 The spring rolls came in either shredded beef or miso chicken and were wrapped up in rice paper with shredded carrot and herbs. The beef had been marinated in ginger and soy sauce and was absolutely beautiful. The spring rolls were served with a slightly spicy chilli and coriander dip, and the whole dish was light and refreshing without being too filling. It would make a great side to one of their rice or soup dishes, I feel. 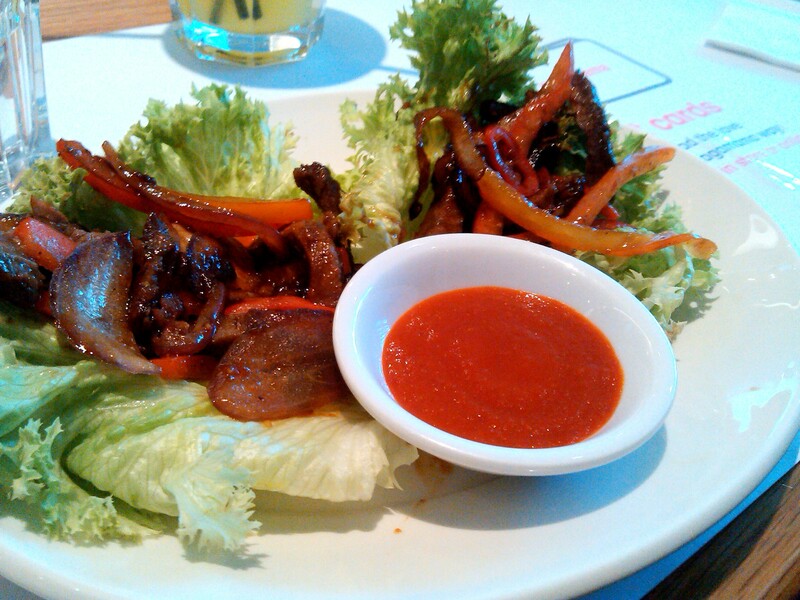 The other side dish on offer was a lettuce wrap with marinated beef strips, peppers, onions and chillis that were in a sticky barbecue sauce. The dish came with the lettuce leaves lying open, and you had to roll it all up yourself and then eat it! It was quite messy, but was absolutely delicious. I think this was my favourite dish of the night. It came with a spicy chilli dipping sauce that is not for the faint-hearted! (It’s the same sauce that they cook their firecracker dishes with!) As someone who can’t handle their spice, I found the dish tasty enough without needing to dip it excessively in the sauce! Next, it was on to the salads! I must admit, MrJ and I are not salads type of people. We like a side salad with a slice of lasagne or shepherd’s pie or something, but a salad on it’s own just makes me think a little of rabbit food, and usually they aren’t very flavoursome. However, this notion was totally dismissed when we tried wagamama’s salads! 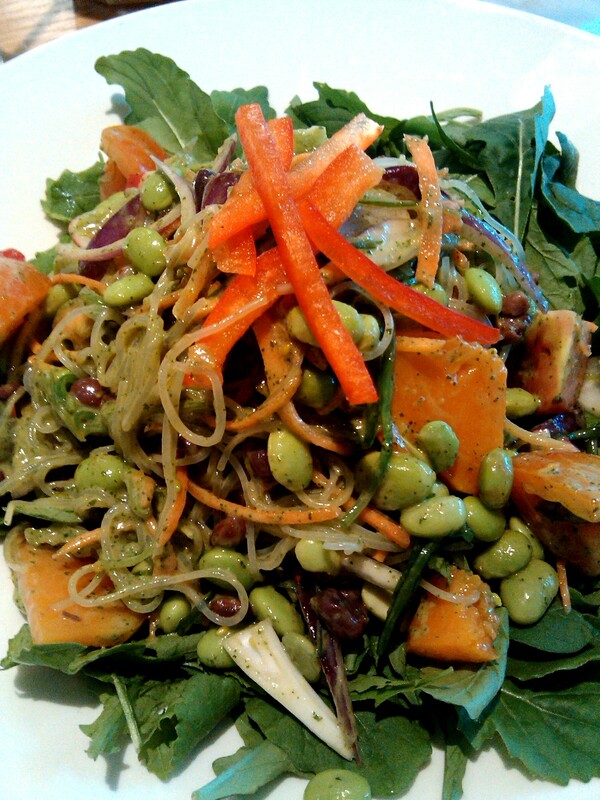 First up was a vegetarian salad containing glass noddles, beans and butternut squash to name a few. It was an explosion of different flavours and textures as spicy was mixed with mild and soft with crunchy. This dish is known to contain a lot of ‘superfoods’ that are healthy and great for your body; so you can eat plenty without feeling any guilt! It certainly looked impressive on my plate! 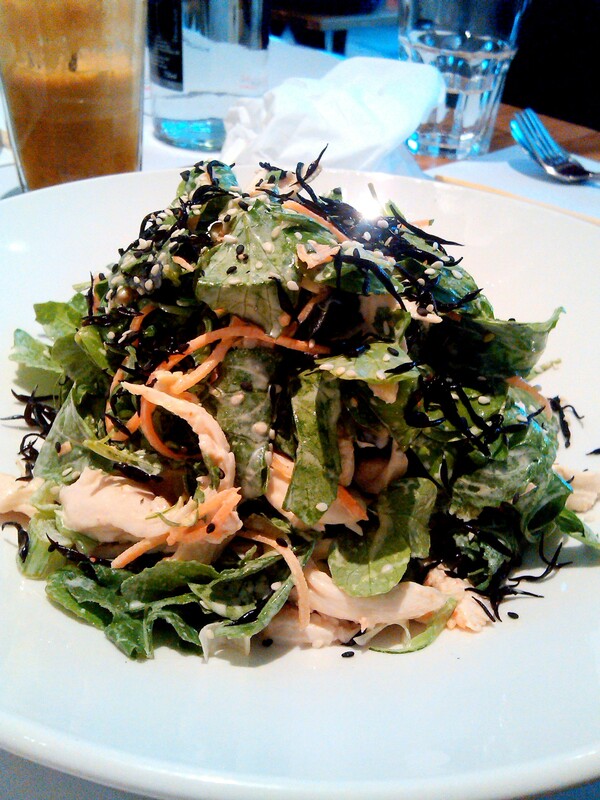 Our second salad came in either shredded chicken or salmon and was tossed in a wasabi mayonnaise dressing and served with a mixture of greens, wasabi rocket and seaweed. MrJ preferred the chicken version of this dish, while I preferred the salmon (I’m a sucker for salmon, as soon as I see it on a menu I’m sold!). (Another tie-breaker one for you there!) I also really enjoyed the sprinkling of sesame seeds on the top of the salad. 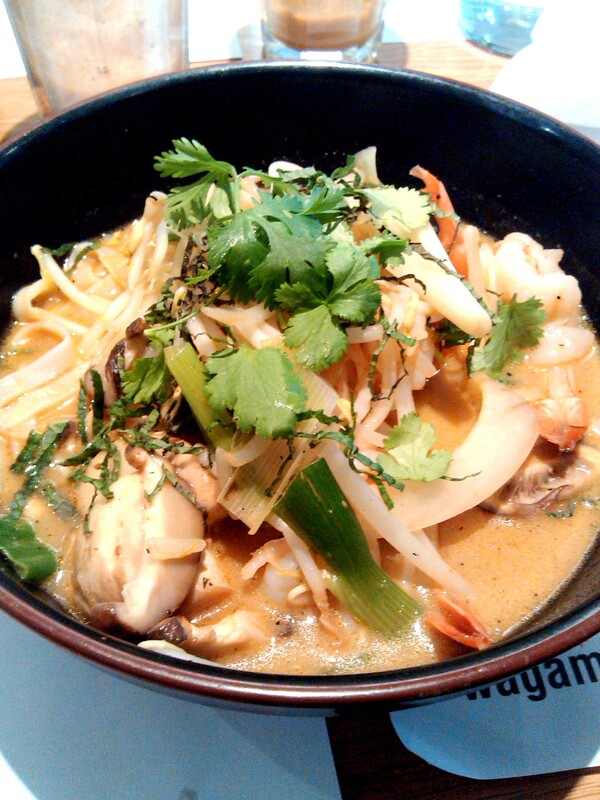 The new main course addition to wagamama‘s spring/summer menu is a rice noodle broth served with either stir-fried chicken or prawns. The broth has a lemongrass and coconut base so has a slight thai curry taste, with a spiciness and warmth that only an oriental broth can bring! There was a great ratio of noodles, beansprouts and chicken/prawns to the broth and I think this will go down a storm with anyone who is already fond of wagamama‘s noodle soups. After trying 8 different dishes, we were absolutely stuffed but in a good way as everything we had ate was packed full of vegetables, flavours and spices. I think that these dishes are going to be very popular – especially the salads! If you like any of the dishes that you have seen feature on this blog post, you can order them at your local wagamama (for us in the Newcastle area, they can be found at Old Eldon Square, or the Yellow Mall at the metrocentre) from Tuesday 21st May! Thanks again wagamama for a fantastic night, you do spoil us!